Radiation protection is an integral component of the working infrastructure of any department dealing with radiation. The main principles of radiation protection are to provide adequate protection from undue exposure of radiation to personnel directly or indirectly involved with radiation, without unduly limiting the benefits of radiation exposure. Fatigue avoidance scheduling tool (FAST) was employed as an indicator of fatigue prone work rest schedule. Fatigue risk among naval fighter pilots during air borne operations was assessed; work sleep and flying patterns showed significant association among variables. Radiation has an inherent risk. It has beneficial effects such as ability to ionize, excite molecules and kill undesired body tissues. When it is used for imaging as well as therapeutic purpose. When risk and benefits are compared side by side, benefits far outweigh the possible risks. There is high prevalence of haematological manifestations in Systemic Lupus Erythematous (SLE) (85%) . Autoimmune haemolytic anaemia is rare, and bone marrow hypoplasia is even rarer. It is important to know that patient can present with bone marrow hypoplasia with pancytopenia even before typical manifestations of SLE. This is a case report of a 12 year old girl child, who presented with fever, cough and weakness. On investigation, she was found to have pancytopenia due to bone marrow hypoplasia. Subsequently she developed skin lesions and renal manifestations suggestive of SLE with anti-nuclear antibodies. Sepsis is a major challenge in Surgical ICUs. The burden on financial resources incurred by sepsis patients is enormous. Therefore, it is necessary to prognosticate and assess the utility of surgical interventions in such patients. 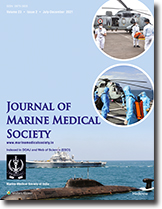 We carried out a prospective observational study in the surgical ICU of a tertiary care armed forces hospital over a period of 2 years and found that the commonest source of infection in severe sepsis was intra-abdominal, APACHE II was a reliable prognosticating score and that surgical intervention for source control improved mortality considerably. Various factors contribute to rise in intracranial pressure (ICP). Autoregulation of cerebral perfusion pressure in these cases is vital. Decompressive craniectomy in neurosurgical emergencies resulted in improved outcome. We present INHS Asvini experience on decompressive craniectomy for raised ICP. Background: As a result of greater understanding of disease processes, enhanced awareness of cost effectiveness and risk-benefit correlations, and better communication between medical and dental practitioners, the guidelines for antibiotic prophylaxis have been significantly altered. From the standpoint of surgical procedures, antibiotics are rather overrated when considering the incidence of infections. There is often confusion and misinformation concerning the indications and scientific basis for the use of antibiotics in conjunction with dental procedures. Methods: The medical and dental literature was reviewed for scientific evidence regarding the use of antibiotics to prevent local and systemic infections associated with dental treatment. Situations commonly considered by dentists for potential use of prophylactic antibiotics were reviewed to determine current evidence with regard to use of antimicrobial agents. This included prevention of distant spread of oral organisms to susceptible sites elsewhere in the body and the reduction of local infections associated with oral procedures. Results: There are relatively few situations in which antibiotic prophylaxis is indicated. Aside from the clearly defined instances of endocarditis and late prosthetic joint infections, there is no consensus among experts on the need for prophylaxis. There is wide variation in recommended protocols, but little scientific basis for the recommendations. The emerging trend seems to be to avoid the prophylactic use of antibiotics in conjunction with dental treatment unless there is a clear indication. Conclusions: Aside from the specific situations described, there is little or no scientific basis for the use of antibiotic prophylaxis in dentistry. The risk of inappropriate use of antibiotics and widespread antibiotic resistance appear to be far more important than any possible perceived benefit. Clinical Implications: Dentists should use antibiotic prophylaxis in only those specific situations in which there is a valid scientific basis for it. Changes in use of antibiotics are imperative if clinicians are to limit the resistance of bacteria to these drugs. Late postpartum eclampsia (LPE) is relatively rare disease with atypical presentations which makes delay in diagnosis. We present a case report of LPE which was successfully managed in our centre. P rospective study of 20 patients with spinal cord injuries between a period from June 2009 to June 2012 at Tertiary care centre. The mechanism of injury, level of cord insult, surgical approach, neurological outcome and complication were evaluated. There was mean improvement of two Frankel grades after surgical stabilisation. Neurosurgical procedures may be associated with significant blood loss. The role of tranaxemic acid in decreasing blood loss In nerosurgical operations was studied prospectively and compared with retrospective cohort. Vacuum assisted closure is being increasingly used for wound management. Whilst reconfirming evidence of successful outcome from its use in many scenarios; this study also identifies the potential non-beneficiaries of VAC use. Fats consist of a wide group of compounds that are generally soluble in organic solvents and largely insoluble in water. All fats consist of fatty acids bonded to a backbone structure, often glycerol. Fats are the sources for fat soluble vitamins and essential fatty acids. They provide energy and stability to many internal organs. The sources of fats are milk & milk products, eggs, meat, pork, beef, chicken, fish, nuts and vegetable oils. There is a probable causal link between intake of saturated fatty acids and type 2 diabetes and a possible causal association between total fat intake and type 2 diabetes. There is convincing evidence that high intake of Myristic & Palmitic acids and trans fatty acids contribute to an increase in risk for cardiovascular diseases. There is a convincing association for consumption of fish and fish oils and foods high in linoleic acid with reduced risk of cardiovascular diseases. A “probable” level of evidence demonstrates a decreased risk of cardiovascular diseases for alpha-linolenic acid, oleic acid, nuts (unsalted), plant sterols and stanols, and no relationship for stearic acid. Hence it is recommended that the total fat intake should be reduced to less than 30% of total calories, saturated fat intake should be limited to less than 10% of calories and trans-fatty acids eliminated. It is also recommended that diets should provide an adequate intake of Poly Unsaturated Fatty Acids (PUFAs), i.e. in the range 6-10% of daily energy intake. Intake of oleic acid, a monounsaturated fatty acid, should make up the rest of the daily energy intake from fats. These dietary goals can be met by limiting the intake of fat from dairy and meat sources, avoiding the use of hydrogenated oils and fats in cooking, using appropriate edible vegetable oils (avoid coconut and palm oil) in small amounts and ensuring a regular intake of fish (one to two times per week) or plant sources of alpha-linolenic acid. Preference should be given to food preparation practices that employ non-frying methods. Pranali, A five year old girl who sustained grievous head injury as a result of fall from the 4th floor underwent a decompressive craniectomy. Reconstruction with autologous bone failed due to resorption. Rib graft reconstruction was carried out with satisfactory cosmetic results. A 73 years old individual under treatment of a private practitioner for Dementia, was noted to have Bilateral Subdural Hematomas. Repeat CT Scans done after evaluation at a tertiary care centre showed complete resolution. A 47 year old lady presented with features of spontaneous Intracerebral Haemorrhage (ICH). CT scan showed a right frontal hematoma with diffuse Subarachnoid Haemorrhage (SAH). Digital Subtraction Angiography (DSA) revealed Descending Anterior Cerebral Artery (DACA) and Middle Cerebral Artery (MCA) aneurysms. Managed with hematoma, evaluation and aneurysm clipping, she made a good recovery.